Ventura River Ecosystem: Next steps - Notching? No matter who you speak with about Matilija Dam, the question always comes up; "Why not just take the dam down a bit at a time and let the river gradually remove the sediment?" Indeed, one of the newspaper editorials this summer suggested "that the dam be notched down to the top of the silt in 2011 so that all future rain waters and silt in the drainage shed will flow to the ocean, like before the dam was constructed." And Patagonia's Yvon Chouinard weighed in with, "Notching it down bit by bit, year after year... That's what I think is the solution." Even a 3rd-grader suggested notching during a class presentation almost a decade ago. So it would seem like a logical approach. In the world of sediment management alternatives for dam removal, notching is categorized under 'Natural Transport' - or in more simple terms, let the river do the work. In the last decade much progress has been made with analysis and demonstrations of natural transport. This information is summarized in a document produced for the Matilija Workgroup by Matt Stoecker. And this summer, in the biggest project of its kind, the removal of two dams on the Elwah River in Washington State will begin, one notch at a time. Currently there is a plan for the removal of Matilija Dam, its components described in the poster we printed last year. This plan is the result of a multi-year feasibility process that began in 2000, achieved consensus and local signoff in 2004, and made it all the way up through the ranks to ultimately gain congressional authorization in WRDA 2007. Changes to the federal plan will require re-approval, the level of which will depend on how drastic any changes may be. 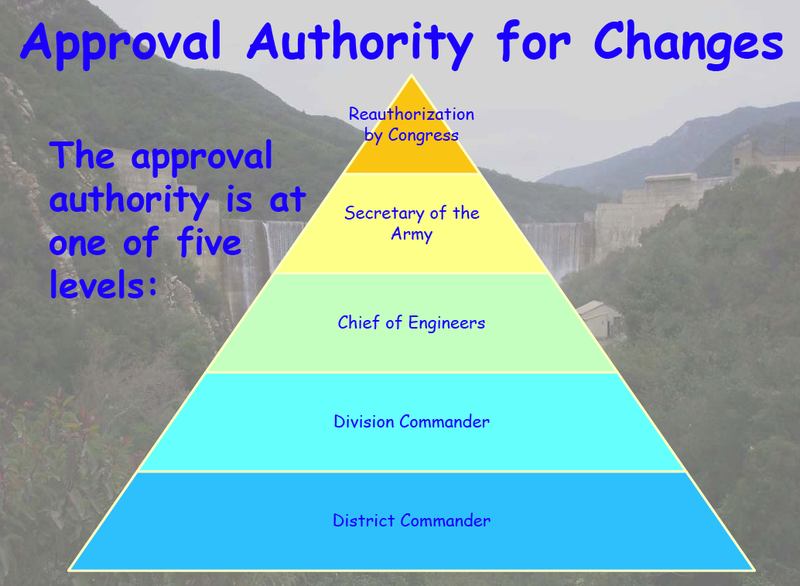 A minor change may only require local approval, while more significant changes would trigger additional environmental review, and perhaps congressional re-authorization. An explanation of the Corps thinking behind fine sediment management is shown in the diagram below. 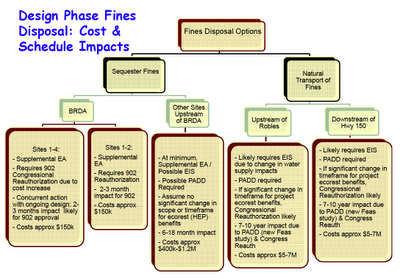 Cost overruns were stated as the primary reason the Corps did not implement the 2004 consensus plan for the temporary disposal of fine sediments at (BRDA - Baldwin Road Disposal Areas.) 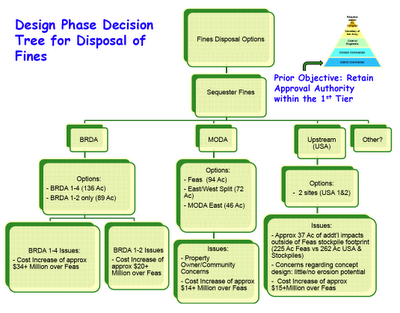 Permanent disposal at MODA - Meiners Oaks Disposal Area was seen as preferable, but encountered community opposition. The more recent USA - Upstream Sediment Areas was an even greater departure from the approved plan, and drew even heavier public scrutiny. Now, taking a broader look at potential alternatives, the Corps estimates that the additional studies and review for Natural Transport would take another decade and cost up to $7M. The other major consideration with natural transport is the reason the project got so complex in the first place: Robles Diversion Dam. 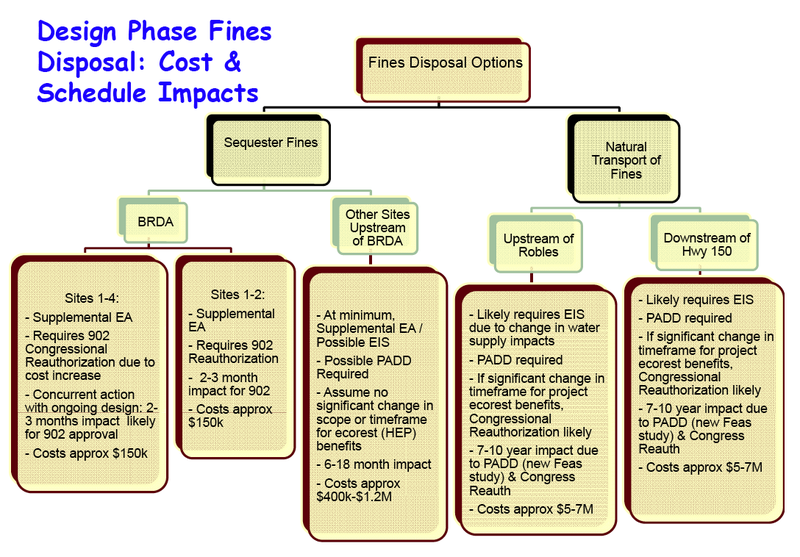 The feasibility plan called for dredge-and-slurry of the fine sediments that are concentrated immediately upstream of Matilija Dam, so as to bypass Robles Diversion and eliminate any threat to the water supply in Lake Casitas. This concern still exists, along with the concerns of the other water agencies at the table. But if we are truly committed to removing Matilija Dam, funding a $150M+ project is an even bigger hurdle. The project is still lacking the commitment for almost $100M in federal funding. The majority of the non-federal matching funds is expected to come from the State, but this, too, may be a long time coming in the current era of budget cuts. There may be ways to greatly reduce the overall price tag of the project if some degree of natural transport is used. 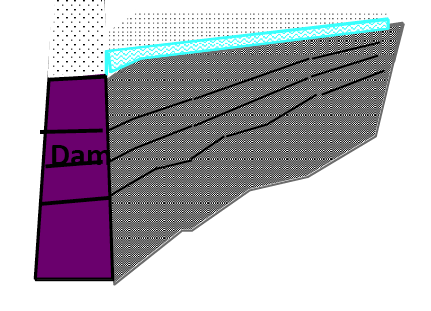 At the very least, the dam should be notched down to the current silt level to avoid any further accumulation of sediment. Studies predict that the dam will trap an additional 3 million cubic yards of sediment, or half again as much as currently sits in Matilija Canyon; thus every major rain event increases the eventual cost of dam removal. 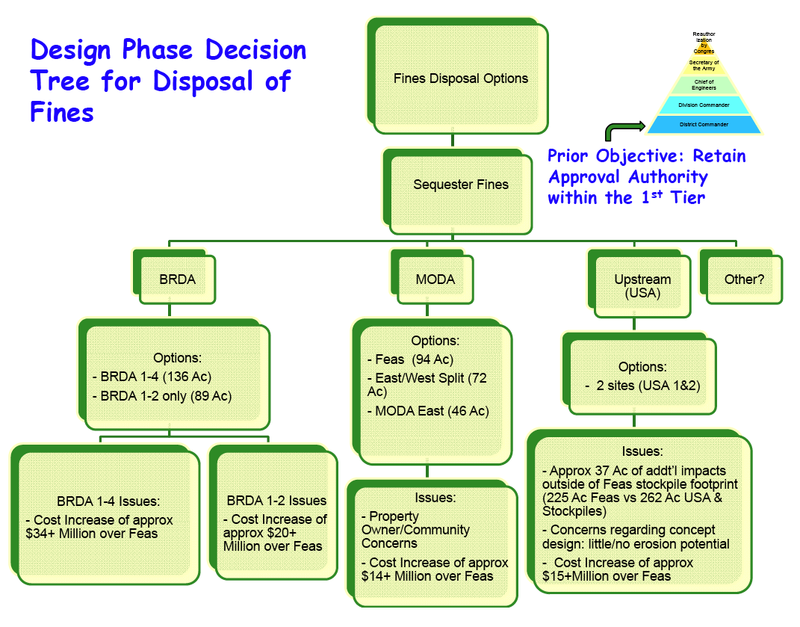 The Feasibility Study did also analyze a 2-phase notching scenario, so there may be ways to tag onto this analysis without triggering complete re-authorization. The Matilija Coalition has consistently advocated that cost effectiveness and ecosystem restoration go hand-in-hand. Last year we published an array of alternatives titled "Sediment Management and Restoration Opportunities for the Matilija Dam Ecosystem Restoration Project" This document suggests ways that sediment management may be optimized within the context of the feasibility plan to avoid impacts and maximize cost effectiveness. Note that the Corps' objective has always been 'disposal' of sediments - with an strong preference to permanent landfills. However, another way of looking at this is to recognize the role of sediment in the ecosystem, and devise a means to make use of this resource and reintroduce it in a controlled manner. There is no question that letting the river do the work will cut costs. Whether these concepts can advance remains to be seen. The next meeting of the Matilija Dam Fine Sediment Workgroup is scheduled for Thursday Feb 24, 2011.